Halitosis may seem to be trivial issue and it isn’t life threatening, but it is certainly no laughing matter. Halitosis is the medical term for bad breath and this can be quite serious as a social problem and thereby give rise to psychological disorders. Halitosis can cause extremely embarrassing situations in social interactions and relationships at work and in your personal life as well. Halitosis can be extremely damaging to an individual’s self esteem and confidence giving rise to severe depression and isolation. Individuals who suffer from halitosis tend to avoid interactions for fear of embarrassment and to avoid any awkward interactions. There are therefore a lot of misgivings about halitosis and bad breath. Very often an individual may be blissfully ignorant about the condition but could cause discomfort to those around. Part of the reason for the unpleasant social status of the condition could be attributed to the fact that most of us tend to assume that poor dental hygiene is the cause for the condition. This is of course not really the case and any informative halitosis definition would make it adequately clear that at times even the best dental practices may not help to avert the condition. Halitosis can be caused by a variety of conditions, many altogether unconnected to dental health. Identifying the cause is essential to find a lasting cure with any halitosis remedy or medication. While bad breath or halitosis may be caused by poor dental hygiene and can certainly be aggravated by it, this is not the only cause, and many a time an individual may suffer from halitosis despite maintaining a stringent dental care routine. No matter what the cause the unpleasant odor can generally be attributed to a bacterial build up in the mouth. Bacteria exist in the mouth even in healthy individuals and they do interact with food residue or debris in the mouth producing a foul odor. This becomes a problem when the bacterial population begins to increase dramatically. Bad breath may also be caused as a result of some other medical condition and may even be aggravated or caused by poor eating habits and food choices or an unhealthy lifestyle. Conditions like liver or kidney disorders may cause halitosis, which is why if bad breath remedies and other home treatments do not produce any results you should get medical attention. Halitosis refers to foul or bad breath, which is not an uncommon condition. Unfortunately, most people who offend in this respect are completely unaware of their problem. Bad breath usually originates from the mouth and the intensity or severity of the problem may vary during the day depending on the type of foods consumed. Certain foods like garlic and onions or red meat and fish can severely aggravate the problem, and smoking or alcohol consumption can also aggravate it greatly. Bad breath can also be caused by dryness of the mouth, which is why individuals who do not consume adequate water may suffer from halitosis. Very often the problem may be present only in the morning because the inactivity and lack of oxygen in the mouth during the night could cause the odor to worsen. It generally reduces after rinsing the mouth or brushing the teeth. It’s therefore quite hard to prevent bad breath in the early morning or for that matter even when fasting. Chronic bad breath is however a persistent problem that should be treated with medical care. Halitosis can affect absolutely anyone irrespective of age or gender. The problem does tend to be quite common in the aged because tooth decay generally advances with age. But tooth decay is again not a restrictive condition and could affect anyone. In addition halitosis has many other causes. Halitosis in children is in fact not uncommon, because of unhealthy eating habits and poor dental care. Bad breath remedies for children should therefore primarily focus on good dental care and healthy eating habits. In mild cases, treating halitosis at home will be quite simple but if unresponsive halitosis treatment should be sought from your doctor. The most obvious sign of bad breath is when you smell your own breath! Put a handkerchief or even blow on your palm and smell. If the smell is odorous, you have bad breath. Self diagnosis is off course not very effective at most times as experts believe that acclimatization hampers detection of halitosis symptoms. For this reason it may be wise to confide in a trusted family member to make the diagnosis and to detect whether the emanating odor originates from the mouth or nose. Another symptom of halitosis that could actually be the cause of the problem is dryness of the mouth. If you experience noticeable dryness of the mouth or observe a coating on the tongue there is a good chance that you suffer from halitosis. The most common cause of bad breath (halitosis) is diseased gums. Dental decay at the roots of the teeth may result in abscesses in the gums with foul-smelling pus, giving an objectionable odour to the breath. Even small holes in the teeth may provide a place where germs can multiply and release foul odours. Other causes of bad breath are conditions of the nose, throat, respiratory tract, or stomach which are associated with chronic infection or local upsets of one sort or another, such as chronic tonsillitis, lung diseases like chronic bronchitis and bronchiectasis, chronic gastritis, and sinusitis which causes a discharge at the back of the throat. Many cases of bad breath, however, are caused by gastro-intestinal disorders, intestinal sluggishness and particularly by chronic constipation. Bad breath or halitosis causes are typically attributed to bacterial activity in the mouth that causes a release of chemical molecules that contain sulfur. A high protein diet can aggravate the problem as these chemicals are released from bacterial activity on protein. Smoking is known to be a common cause for halitosis and can also aggravate the problem. This may also be because of the increased risk of gum disease from smoking. You may also need to be careful about your diet as there are certain foods like garlic, onion and some strong spices like cumin that can contribute to the problem. Protein rich foods, particularly foods like red meat, fish and cheese may also contribute to halitosis. Low carbohydrate diets are also known to aggravate or contribute to the problem of bad breath. Crisp and hard foods like chips often tend to get lodged in the mouth and if you don’t brush your teeth and rinse your mouth thoroughly enough it would increase bacterial activity and decay. Dryness of the mouth may be caused by various factors including certain illnesses. At other times simply not drinking enough water can cause dryness of the mouth, which will result in halitosis. In such a scenario it is important that you increase your fluid intake with water and fresh fruit juices. Chewing on sugar free chewing gums will also help to stimulate saliva production, which will help neutralize bacterial activity and the consequent tooth decay. Dentures or dental appliances may very well be part of the problem as it is common for food debris to get lodged in braces or other appliances, particularly if not cleansed properly. Dentures that have been poorly fitted can also cause abrasions or sores in the mouth that may result in localized infections resulting in halitosis. Certain medical conditions and drugs may also cause halitosis to develop like diabetes or gastro-esophageal reflux disease. Gingivitis is basically a periodontal disease that causes inflammation of the gum tissue surrounding the teeth. The condition is not just painful, but it can at times also contribute to the development of halitosis. In such a scenario it is imperative that the underlying cause or the gingivitis problem is first treated, rather than attempting to cure halitosis. The problem of halitosis should resolve naturally once the underlying cause is eliminated. 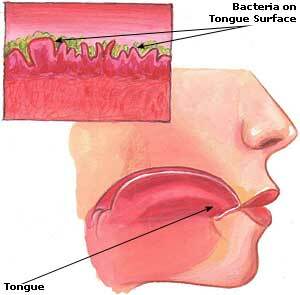 Tonsil stones are another condition that can cause very severe halitosis. Tonsil stones or tonsilloliths are in fact a common cause for chronic halitosis, with bad breath actually being one of the main symptoms for the presence of tonsil stones. They are basically tiny and hardened lumps or stones, containing sulfa and bacteria, that develop in pockets of the tonsils. They emanate foul odors, particularly when crushed or broken, but will always cause bad breath. Xerostomia, which is the clinical term for dry mouth is not really a disease in itself but is usually a symptom of some underlying disorder. It is basically a condition in which there is excessive dryness of the mouth because of a decrease in, or absence of saliva production. This is therefore one of the primary causes of halitosis. Saliva keeps your mouth moist and helps with digestion of food and also helps to fight of cavities, tooth or gum decay by washing away debris from food and plaque from the teeth. Tooth enamel also suffers in the absence of saliva as acids present in the mouth would normally be neutralized with saliva. Dry mouth or xerosomia therefore leaves you vulnerable to a variety of dental conditions that would only worsen the problem of halitosis. The condition may not always be caused by a disease, but may simply be due to dehydration, resulting from inadequate fluid intake, or also as the effect of certain drugs. Increasing your fluid intake, which would imply water intake, should help significantly. Chewing on sugar free gums may also help as the chewing action stimulates saliva production. It would be important to identify the cause and get it treated swiftly if not due to inadequate fluid intake, as it could cause other dental health problems to develop. Zenker’s diverticulum is another condition that could be responsible for halitosis, but is usually limited to older individuals. IT is a condition in which a pouch develops towards the back of the throat in which food debris may get lodged and accumulate causing various symptoms, one of them being halitosis. The condition impairs digestion and partially digested food may be regurgitated, causing halitosis. In addition the action of micro-organisms breaking down food in the pouch itself leads to the emanation of a foul odor. Patients on a post nasal drip are also likely to suffer from severe halitosis. Unripe guava is useful in halitosis. It is rich in tannic, malic, oxalic, and phosphoric acids as well as calcium, oxalate, and manganese. Chewing it is an excellent tonic for the teeth and gums. It helps cure bleeding from gums and stops bad breath. Chewing tender leaves of guava tree also stops bleeding from gums and bad breath. Parsley is a valuable Cure for bad breath. Two cups of water should be boiled and several sprigs of parsley, coarsely chopped, should be steeped in this water along with two or three whole cloves or a quarter teaspoon of ground cloves. This mixture should be stirred occasionally while cooling. It should then be strained and used as a mouthwash or gargle several times a day. Patients suffering from halitosis should take a well-balanced diet consisting of seeds, nuts, grains, vegetables, and fruits, with emphasis on raw and cooked vegetables, and fruits. In case of constipation, all measures should be adopted for its eradication. The patient should avoid refined carbohydrate foods, such as white sugar; white bread and products made from them, as well as meat find eggs. The teeth should be cleaned twice a day, especially before going to bed at night. Meat particles should be removed carefully with toothpicks. In case of decaying teeth and swollen and bleeding gums, a dentist should be consulted. Munching a raw apple or guava after lunch removes most of the trapped particles. The use of the twigs of the margosa (margosa) tree as a toothbrush is the best method of cleaning the teeth.